There are around 4.16 million IT professionals working in the United States today, and that number is expected to grow by 22 percent through 2020, according to research company CompTIA. Most of those new jobs will be geared toward software development, while computer engineering jobs will remain in relatively short supply. 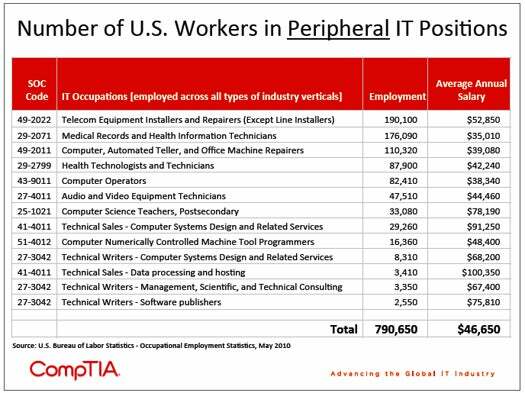 In a newly released report titled "CompTIA's IT Industry Outlook 2013," the research company provides a detailed breakdown of the IT job market and goes one step beyond other job reports: CompTIA takes the time to separate IT occupations -- that is, jobs that require tech skills -- from jobs in the IT industry, which can range from technical to menial. The U.S. IT industry -- software developers, computer manufacturers, and telecom companies -- comprises around 168,145 employers (that is, companies with payrolls), who employ a total of around 4.6 million workers, both technical and nontechnical. Additionally, there are around 421,174 "self‐employed, non-employer" entities, which include consultants, contractors, and other types of entities that don't have a payroll. In all, that means the U.S. IT industry represents around 5 million jobs. Meanwhile, the report estimates that there are around 4.16 million core IT jobs -- software developers, network admins, and DBAs -- spread out among all industries in the United States. To be clear, only some of those 4.16 million core IT occupations are subsets of the aforementioned 5 million IT industry jobs; for example, a systems analyst at IBM or a Web developer at Salesforce.com would represent a core IT job in the IT industry. A systems analyst for Chase or a Web developer for Geico would represent a core IT job that's not part of the IT industry. An office administrator at Microsoft or a facilities manager at Apple would be non-IT jobs within the IT industry. The report provides a snapshot of how core IT positions break down today and an idea of how the IT job landscape will look come 2020. Overall, CompTIA predicts that the total number of core IT jobs in the United States will increase by 22 percent by 2020. The IT occupation with the highest project growth through 2020 is systems software developer. The total number of jobs will grow by 32 percent, from 387,050 to 510,906. Systems software developers currently earn around $100,420 per year. DBAs jobs will increase by 31 percent through 2020, jumping from 108,500 to 142,135. Average annual salary for DBAs is $77,350. Application software developer positions will swell by 28 percent, from 539,880 to 691,046. They earn an average salary of $92,080. Network and systems admin jobs totaled around 341,800 in May 2011. The number will jump to 437,504 by 2020, a 28 percent change. Currently, these IT pros earn an average annual salary of $74,720. Computer systems analyst jobs now number 487,740 and will increase by 22 percent to 595,043 in 2020; $82,320 is the average annual salary for this position. Jobs that fall under the broad category of security analyst, Web developers, and network architects now number 272,670. That figure is expected to rise to 332,657 come 2020, another 22 percent shift. Annual salary is around $81,670. There were around 25,160 computer and information research scientist jobs in the United States in mid-May 2011. By 2020, CompTIA estimates the figure will hit 29,940, 19 percent more. This group makes on average $103,160 per annum. There are around 632,490 computer support specialists now. By 2020, the number will increase by 18 percent for a total of 746,338. Average annual pay is $51,820. Computer and information systems managers number around 300,830 today; by 2020, that number will be reach 354,979 for growth of 18 percent. They earn an average of $125,660 per year. There are around 320,100 computer programmer jobs in the United States right now, a figure that will jump by 12 percent to 358,512 by 2020. Programmers take home a yearly salary of around $76,010. Hardware engineers now number 71,990, and by 2020, there will be around 9 percent more for a total 78,469. Annual salary is $101,360. Finally, there are 177,630 miscellaneous computer occupations in the United States. By 2020, the number will rise by 6 percent to 188,288. The average annual salary for this vague category is $80,500. This story, " Software developers expected to see the highest IT job growth come 2020 ," was originally published at InfoWorld.com . Get the first word on what the important tech news really means with the InfoWorld Tech Watch blog . For the latest developments in business technology news, follow InfoWorld.com on Twitter .